Company: Acanthurus coeruleus (Blue Tang surgeonfish) is not suitable company for similar species, groupers and lionfishes. Aquarium Setup: Acanthurus coeruleus (Blue Tang surgeonfish) have a scraping and sorting lifestyle, which should be kept in mind when arranging the aquarium for them. They need a lot of space to thrive, at least 50 gallons for every adult Acanthurus coeruleus. Keep their environment as stable as possible. The ideal temperature is in the seventies to low eighties F. pH need to be buffered and sustained between 8.0 and 8.4. Organic levels should be low to non-existent, with a maximum of 25 ppm nitrate and no ammonia or nitrite. Blue Tang surgeonfish like forceful water movements and aeration. 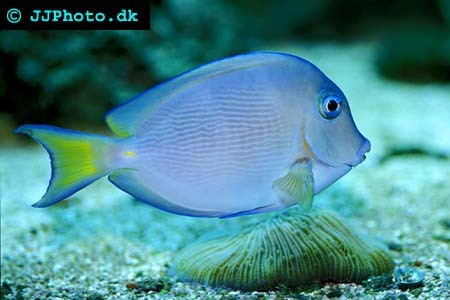 Food: Acanthurus coeruleus (Blue Tang surgeonfish) eat plants and algae. They require frequent feeding, preferably spread out over the whole day. An automatic feeder filled with a mix of dry-prepared foods, or an algae rock can make this easier to achieve. 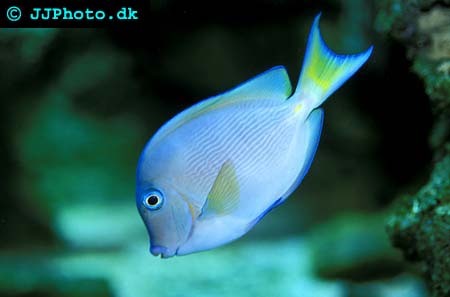 Breeding: There is no imformation available about breeding Acanthurus coeruleus (Blue Tang surgeonfish) in aquariums.